RAINFALL was generally restricted to coastal areas of the east and south of the country, and Tasmania. Cold fronts and onshore flow produced moderate falls in western Tasmania, southern Victoria, and the north coast of New South Wales, while isolated thunderstorms brought light falls in the Kimberley in Western Australia, and the south west of the Northern Territory. Past seven days: At the start of the week, light to moderate falls were reported in the south east corner of South Australia, west coast, south coast, and central eastern Victoria, and western Tasmania as a cold front, with associated cloud band, tracked across the southeast. The front, combined with an upper level trough, produced light showers and isolated thunderstorms in coastal New South Wales from the central coast to the northeast before moving offshore into the Tasman Sea. In the west, embedded thunderstorms in a cloud band across the north west discharged little rain over the Kimberley and Southern Interior Districts of Western Australia and adjacent south west of the Northern Territory. 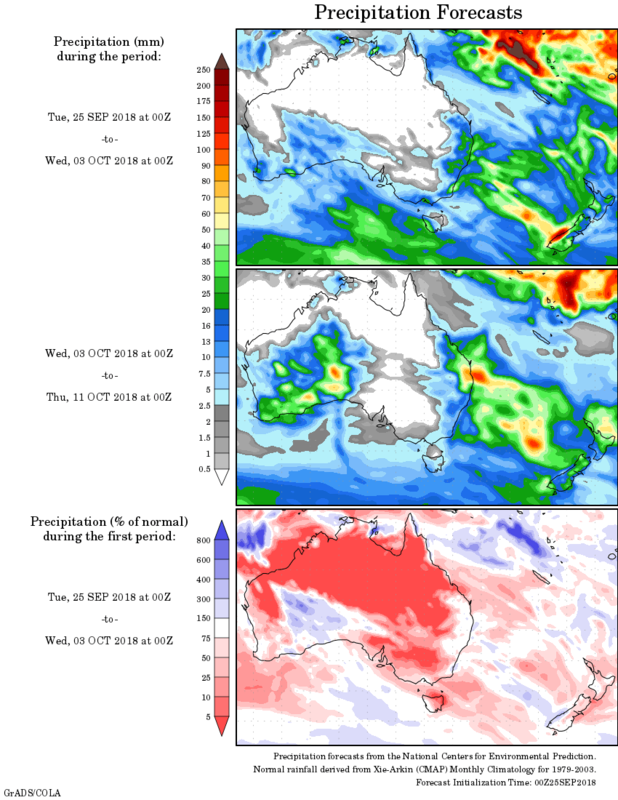 From the middle of the week, light showers along the north tropical coast and south east coast of Queensland were a result of an upper level trough through the peninsula district, as well as a high pressure system producing an onshore flow along the east coast. A weak cold front crossing the southeast brought light to moderate showers in southern coastal regions of Victoria and western Tasmania just after mid-week. In the last few days of the week, interaction between a well-developed trough through inland eastern Australia and a strong high pressure system situated south of the Bight, generated a moist easterly to southeasterly onshore flow along the east coast. Moderate falls were recorded in East Gippsland in Victoria, along the east coast of New South Wales, and along the southeast coast of Queensland. Isolated rainfall totals exceeding 50 mm were recorded in western Tasmania, the Hunter region in New South Wales, and the southeast coast of Queensland. The highest weekly total was 83 mm in Mount Read in western Tasmania. Rainfall totals in excess of 10 mm were recorded around Darwin in the Northern Territory; from the southeast tip of South Australia to the Otways in Victoria, and also about Wilsons Promontory and the southern slopes of the Great Dividing Range in West Gippsland and northeastern Victoria; the central to northeast coast of New South Wales; and small pockets in the north tropical coast and southeast coast of Queensland. Some exposed or elevated locations in Victoria exceeded 20 mm, while totals were in excess of 25 mm over most of the western half of Tasmania. Little to no rainfall was observed over almost all of Western Australia, the Northern Territory, South Australia, northern Victoria, Queensland, and New South Wales away from the coast.